S0553. 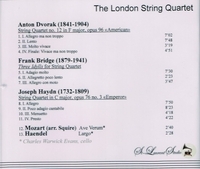 LONDON STRING QUARTET: American Quartet #12 in F (Dvorák), recorded 1927; Three Idylls (Frank Bridge), recorded 1925; Emperor Quartet in C, Op.76, #3 (Haydn), recorded 1924; CHARLES WARWICK EVANS (Cello): Ave Verum (Mozart-Squire); Xerxes – Ombra mai fu (Handel), recorded 1919. (Canada) St Laurent Studio YSL 78-138. Transfers by Yves St Laurent. “The London String Quartet was one of the most important international groups of its time. Numerous premieres, Beethoven cycles, widespread concertising, and eminent recordings marked out its trajectory. The 'live' Library of Congress recordings demonstrate its most vital, sensitive and convincing musicianship in ways that even its studio discs occasionally fail to show. They provide irrefutable evidence that the quartet was one of the very greatest of its time.